All she wanted for Christmas was a bald, weirdly Yoda-like kitten. What she got was a lesson in internet justice. 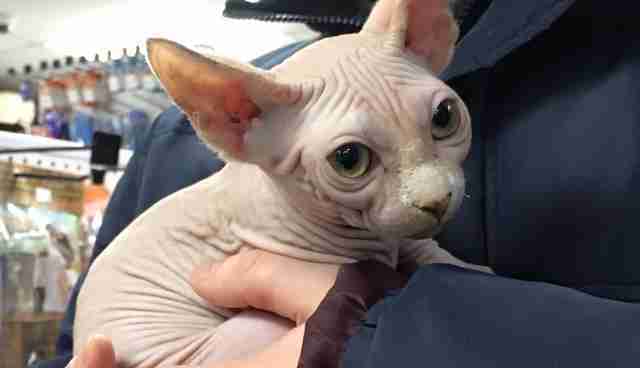 On Monday, a woman stole a rare Sphynx kitten worth over $700 from a pet store in Quebec. Unfortunately for her, the entire catnapping was caught on camera. Rather than going directly to police, however, the store's owners put the footage online and asked the cat snatcher to do the right thing. "A payment or return is requested by December 23," wrote Bill et Bull pet store on Facebook. "Otherwise, we will notify the authorities." By Wednesday afternoon, the video had been watched over 300,000 times. "We didn't think it was going to snowball like this," Bill et Bull owner Sylvie Boisvert told Le Soleil. "I never thought the media would talk about it and so many people would watch the video." In the end, the young woman repented but decided she wanted to keep the ill-gotten kitten. On Wednesday, she returned to the pet store and paid for her new cat. "I never felt so bad in my life," the would-be cat burglar told ICI Radio-Canada. "The cat deserves a good life, I will do everything to make sure it is happy and healthy." For their part, the pet store's owners hold no ill will. "Throughout this whole thing, we were mainly worried about the animal's health," wrote Bill et Bull on Facebook. "We have respected our commitment by not pressing charges. We believe she has learned her lesson."